I occasionally want to write some nerdy ministry posts and I felt like this one needed to be next. It is difficult, however, to write about using TextExpander without being able to show it and I'm not going to spend the money on ScreenFlow to shoot a video. So, bear with me as I'm typing this up instead of videoing it and I'm probably not going to edit before posting. Other pastors have been talking about using templates in ministry to aid efficiency. I've been using them for some time but now I've added a power-wrinkle to them. 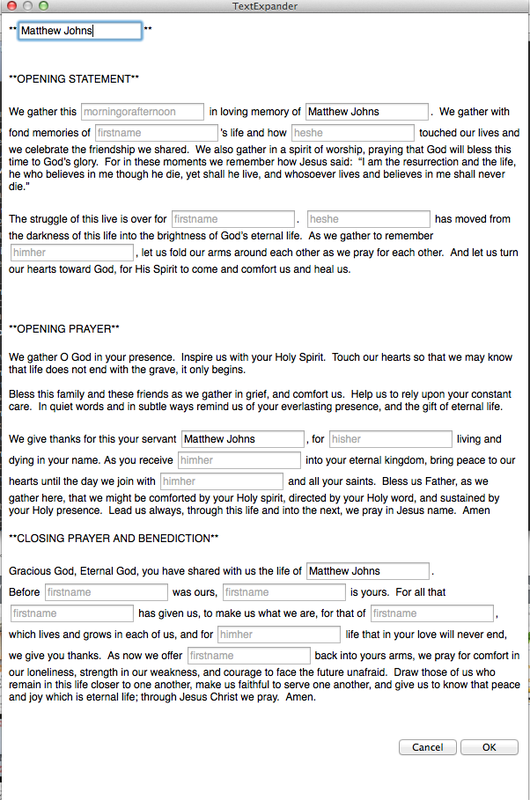 Sometimes, we have to use the same format for different things like a first-time guest email or a worship service. My workflow for that was using the find/replace function in most text editors. That didn't take very long, but I knew it took longer than I liked. In walks TextExpander. TextExpander, for the uninitiated, is an app that will take a simple keystroke and expand it into the full text you want. For instance, instead of typing my whole name out, I can type "nname" and "Matthew Johnson" will appear on the screen. Or, when I'm writing for my dissertation prospectus, I can type " eent" and "entire sanctification" will appear. TextExpander is perfect for lazy writers like me. The great thing about this is, when there are two or more %fill:% items that are exactly alike, it fills the others as you type (I typed my first name and part of my last name for %fill:name% to show you). I also use Markdown, so the asterisks you see indicate that the words are supposed to be in bold. Using Marked, I can preview the rich text and export to PDF, Word, or just print directly from Marked. I can't recommend templates or TextExpander highly enough.